It’s a Laugh a Minute with Olaf in the House! 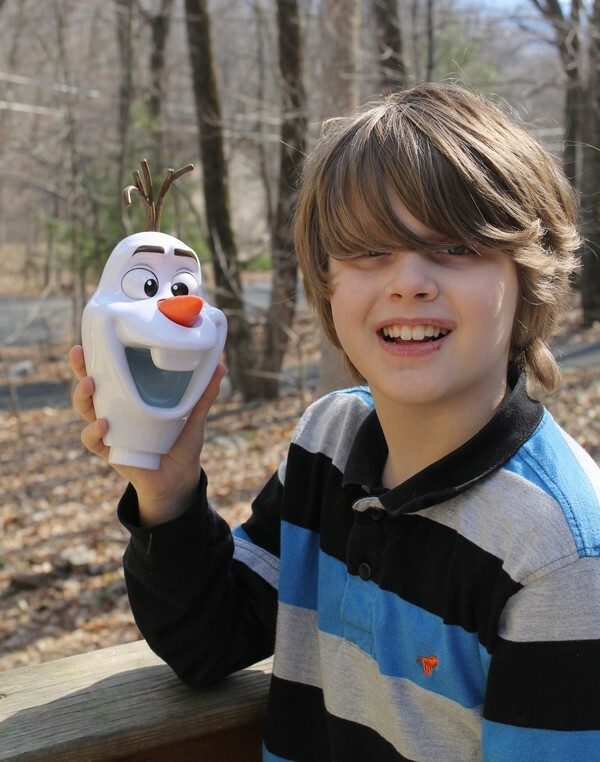 I received an Olaf-A-Lot and Frozen Olaf Snow Cone Maker for the purpose of this review. This post was made possible by Mom Spark Media. Thoughts are my own. My son is absolutely nuts about Olaf. He’s a huge fan of Frozen (who isn’t?) and the silly snowman is his favorite character. Mine too! What’s not to love about a snowman who loves the sun? He’s the epitome of odd, just like us! I signed on to check out two fun Olaf toys from Jakks because I knew my son would get a kick out of them, especially he Olaf-A-Lot! I have to admit, I didn’t think Olaf-A-Lot would be as insanely popular as he’s been with my son. I figured he’s laugh, poke him a few times and forget about him. I planned to sneak him off to my pregnant friend, who is super Olaf-obsessed. Sorry, D., but there’s no way anyone’s getting Olaf-A-Lot out of this house! Pretty cute, right? He sits, he stands, he totally loses his head! What more could you want? 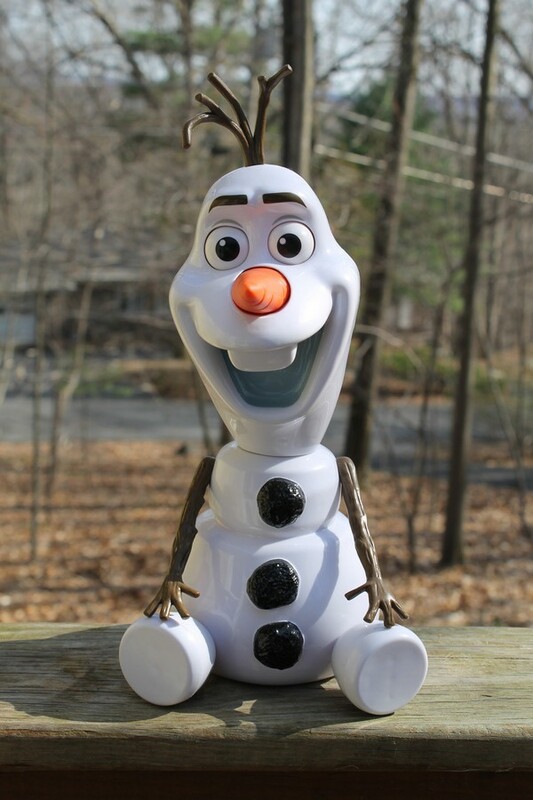 Olaf-A-Lot retails for $24.99 and can be found in your favorite mass retail stores. Basically, Target, TRU, Walmart, Kmart and Amazon. He’s perfect for ages 3 and up (all the way up, as I said, Jake is 9 going on 10). Bonus? He comes with batteries. Thanks, Jakks! Much appreciated! We also received the Olaf Snow Cone Maker. If you remember the novelty snow cone makers we had when we were kids, it’s kind of along those lines. 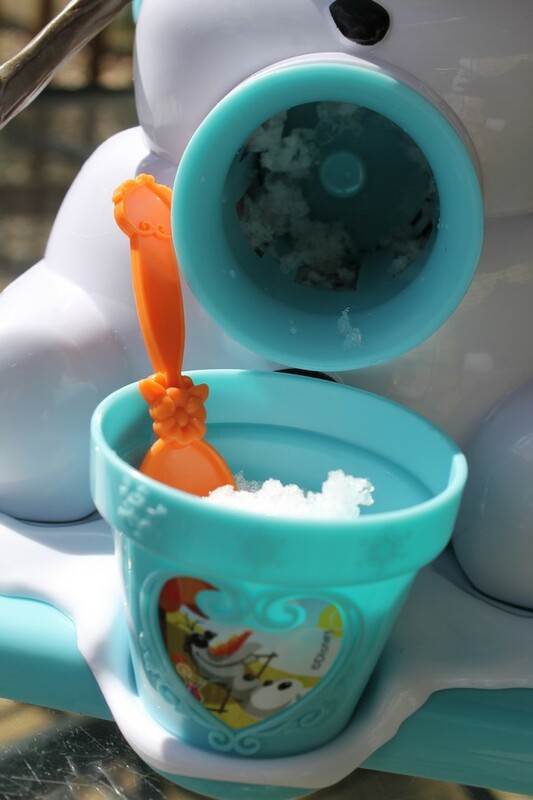 You stick the ice in Olaf’s head, turn the crank while pushing down and it spits out shaved ice. It comes with the snow cone maker itself, a cute molded cup, 1 little flavor bottle, and 2 sugar-free flavor packets (Strawberry and Blue Raspberry). I’ll be honest, it was a bit of a challenge to turn the crank. I have carpal tunnel, though, so that could have something to do with it. This is something that’s fun for your kids on a summer day (or indoors year round). Not really something you’d want to use at a birthday party for a lot of kids because it takes time to crank out a snow cone. It’s definitely cute for fans of Olaf, but of the two, Olaf-A-Lot was the bigger hit in our house. 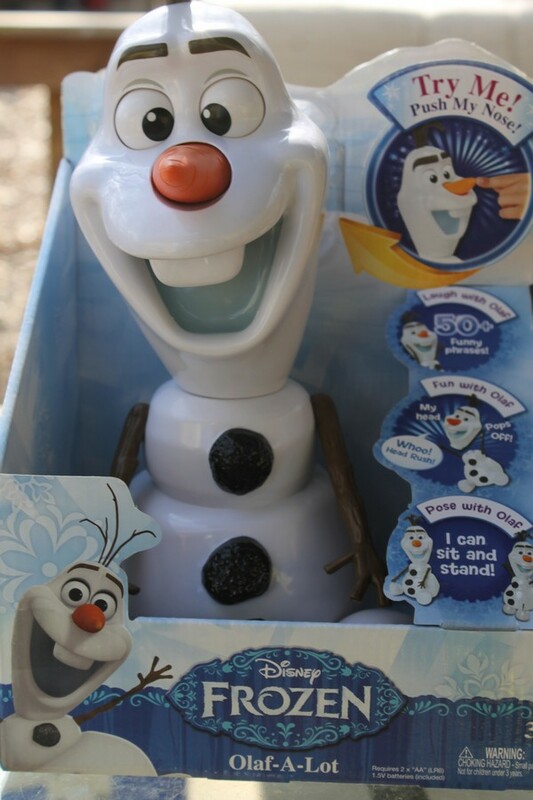 The Olaf Snow Cone Maker also retails for $24.99 and is sold in mass retail stores. Either of these would make great gifts for your Olaf-loving kids! 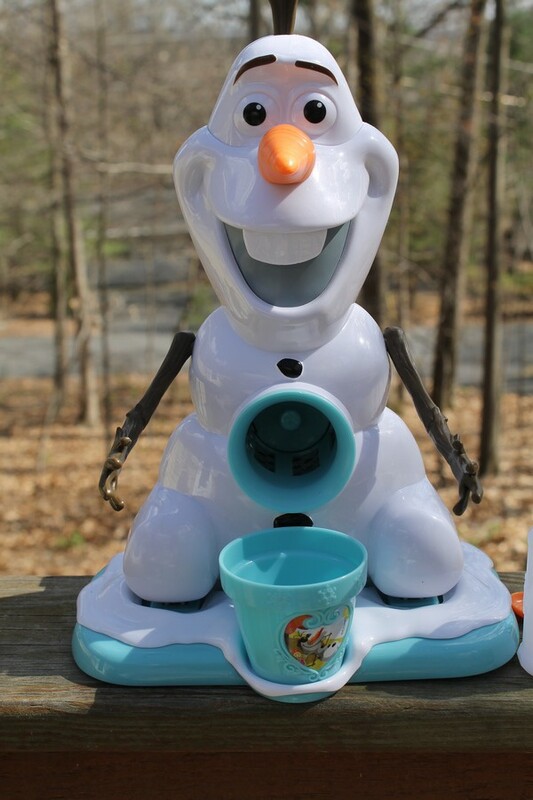 For us, Olaf-A-Lot was the big winner, but we’ll definitely use the Olaf Snow Cone Maker this summer too. Who is your favorite Frozen character? Tell me in the comments! Olaf is my grandson’s favorite! He would love this! My favorite Frozen Character is Olaf! He is so cute and funny,and I really like the Snow cone machine! My niece and nephew would have a blast making snow cones all summer. We need to get one of these.